Made by one of the world’s most popular guitar manufacturers, Luna ukuleles are affordably priced, yet comfortable to play. Offering beautiful, artistic designs, they sound just as good as they look. Here are ten to whet your appetite. A beautiful instrument that’s admired by new and experienced players alike, the Luna Tattoo Mahogany Soprano ukulele features exquisite carved details on its top. A rosewood fretboard offers appealing contrast. If you’re looking for classic soprano ukulele sound, this is an instrument that’s well worth considering. So popular that it’s often out of stock, the Luna Mahogany Series Mo’o acoustic-electric concert ukulele offers the best of both worlds. A laser-etched lizard motif adorns the top, making this instrument a winner in the looks department. The sound is crisp, clear, and bright. A solid spruce top combines with mahogany sides and back, creating a distinctive sound that players appreciate. The Luna Mahogany Series Tattoo Concert Ukulele features a beautiful etched design on its front, plus stylized “sharks teeth” fret markers. This lovely ukulele offers a pure, mellow sound. 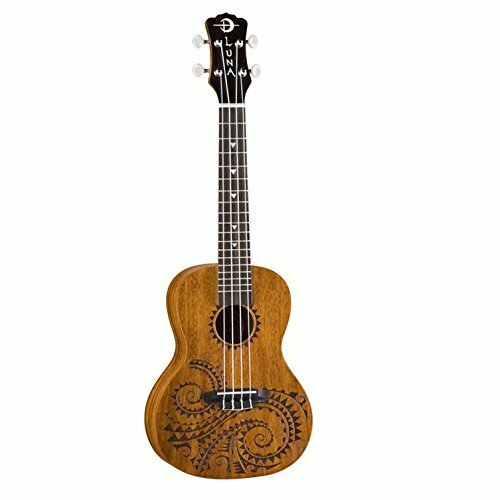 Adorned with the classic “honu” turtle, Luna UKE VMS RDS Vintage Mahogany Soprano Ukulele features a design based on traditional Hawaiian body ornamentation. The sound is rich, classic, and pleasant to hear, plus it projects nicely from the instrument. Beautiful to look at and a joy to play, the Luna Mahogany Series Tattoo concert acoustic-electric ukulele features a gorgeous geometric motif on its spruce top. Perfect for anyone who wants to play with or without an amplifier, it is a step up from a basic ukulele. The sound is rich, mellow, and beautiful to hear. Gleaming mother of pearl and an etched seahorse design adorn the front of this magnificent ukulele. The 23-inch concert top, sides, and back are crafted of solid mahogany, as is the neck. An open-pore satin finish provides a gorgeous look while offering a smooth, enticing feel. Full, rich sound makes the UKEPEARL Seahorse a pleasure to play. A beautiful instrument that sounds as good as it looks! The Luna Exotic Series Spalt Maple Concert Ukulele features a unique crescent moon-shaped soundhole and a contrasting rosewood fingerboard. Vibrant, lively sound combines with delightful sustain and fantastic intonation, making this uke a pleasure to play. Players who are looking for a little something different will appreciate the Luna Artistic Series Great Wave concert ukulele. The top is crafted of select mahogany, and is embellished with the classic “Great Wave off Kanagawa” by artist Hokusai. A natural mahogany neck and transparent blue mahogany sides and back add even more interest. The sound is deep, solid, and rich – a real pleasure to listen to. The Luna Mahogany Series Tattoo Soprano pineapple ukulele features a beautiful Polynesian-inspired motif on its gently rounded front, plus a contrasting rosewood fretboard. This fantastic pineapple uke offers a full, balanced tone with a warm, wonderful sound that’s a little less bright than that of a classic ukulele. A truly exquisite instrument in terms of form and function, the Luna Flora Series Floral Flamed Maple concert ukulele is a 23” concert cutaway size. A gorgeous hibiscus motif adorns the front without detracting from the ukulele’s classic appearance. The sound is absolutely beautiful, and an onboard Preamp adds versatility. When you start shopping for a ukulele, you’ll notice that prices are all over the place. Some of the cheapest start at around $30 USD – but remember, you tend to get what you pay for. Players appreciate Luna ukuleles for their moderate prices (starting around $99 depending on the source) as well as for their quality designs and consistent sound. Many reviewers mention that their Luna ukuleles sound like far more expensive instruments, and this is something to keep in mind if you’d like to stick to your budget while choosing a ukulele that plays well and sounds good. Players who are looking for something stylish, unique, and great-sounding are almost certain to appreciate Luna ukuleles. These exotic instruments are carefully crafted from the finest materials, and each model offers a special touch. Most designs are available in different sizes, and many come with acoustic-electric options for enjoyment in a variety of atmospheres. If you’re new to the ukulele and want to enjoy playing for friends, family members, or even a live audience at your local coffee house or brew pub, you’ll appreciate this list of resources. Choosing a Luna ukulele means you’ll soon own a beautiful instrument that’s worth showing off – so learn how to play a few hits that people will love singing along to.